We had a challenging winter with many snow days. A sudden change of weather brought weeks of warm and beautiful sunny days in March, refreshing our soul. Timea has been doing a lot of travel for speaking and doing demonstrations and workshops at various colleges and national and international conferences and ceramic events, including representing the USA at the Intercontinental Ceramics Project in Valencia, Spain, at NCECA FabLab in Minneapolis, as well as doing joint talks about the collaboration with math professor Sara Billey at the UW annual Math Day and the Math Hour. We are saying good bye to the winter Slip Rabbit interns, Erica, Kayla, Veloria and Xun and to the WXML math team, James, Catherine and Eli. In these past three months, we have accomplished a lot in many areas, from machine hardware experiments to finishing a new project. 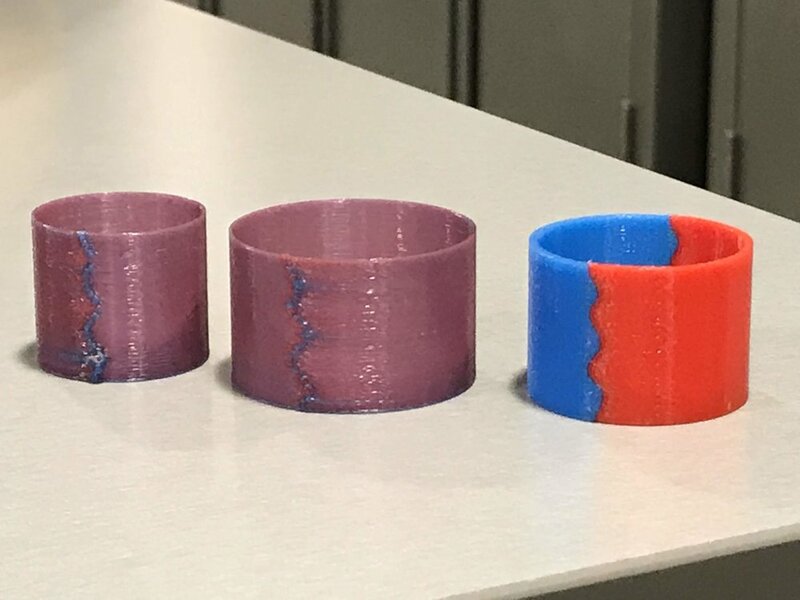 This project, which grew out of Timea’s Universal Potter concept and the ListeningCups, uses a “pathfinder” code in Python (made with the great help of former intern Daria Micovic) for creating a woven texture based on sound data information. The math research was also an example of an exciting collaboration between disciplines. Often times we would found that questions arising from the art process were giving direction of the math and driving that forward. We have generated many possibilities but only had time to print a few possible versions so far. Many more to come in the next months! ListeningCups features Timea’s collaboration about sound data-tactilty, data-stories/data-fictions with interaction designer Audrey Desjardens. Ringató (Cradled) is a technohaptic project by Timea, highly popular and much loved during our Studio Open House events. The Spring Slip Rabbit Open Studio is Saturday, May 11th, 3-5pm. Winter weather in the Pacific Northwest is tempestuous. From mild and sunny in January to a complete shut down of the Seattle metropolitan area due repeat snow storms in February, we have had the extremes and everything in between. This winter, we welcomed Veloria Zhu and Xun Cao as our newest Slip Rabbit interns, who have joined Erica, Kayla and Timea in the studio. Veloria takes over communications and outreach and Xun will work on hardware development with Timea. We are also excited to have the talented graduate student in mathematics, Eli Johnson, joining Sara Billey, Catherine Babecki and James Pedersen in our WXML group as a new graduate research assistant. Former Slip Rabbit intern, Daria Micovic, has also been working with Timea this winter, all the way from her new home in the Big Apple, on writing code in Python for a new project that plays with data lists. Timea will be speaking about her work at Reed College in late February, will be representing the USA at the inaugural Intercontinental Ceramics Project in Valencia, Spain in mid-March, and will be an invited presenter at the FabLab at the 2019 NCECA in Minneapolis in late March. Our research on mathematical sandpile models is ramping up and taking us into really interesting directions for exploring the mathematical logic these patterns and applying this logic to coding. The patterns themselves that we have been developing are becoming more and more complex and ornamental. At the same time, they bear a resemblance to various fiber arts based patterning traditions that have developed over the centuries through human ingenuity and as a result of interactions among craftspeople from diverse ethnic and cultural backgrounds. Report from the Fall: Tactility, Sandpiles, Microcontrollers, Dual Color Printing... -Oh my! The fall brought a more-contracted-than-usual studio schedule due to a heavy load of work obligations at the university. With less operating days per week and several more research directions we wanted to go into, we had to become creative with using resources and planning our progress. We started a close collaboration with the newest UW makerspace, The Mill, and benefitted greatly from the electronics workshops being offered by the first UW makerspace, CoMotion. Our connections with these much larger and more universal makerspaces allow us to tap into both knowledge-base and equipment that is on our “wishlist”. The “wishlist” is long, and contains diverse things like basic programming, Arduino, small motors, dual printers, etc…., which, on the face of it, seem to stray away from ceramics. We find them to be the necessary steps in order to test ideas for experimental augmentations/alterations of the ceramic 3D printer for the purpose of generating new possibilities with clay techniques, forms and surfaces. Slip Rabbit interns, Erica Lee and Kayla Lee (not related) worked with Timea on every aspect of this initial research preparation. We created test forms that challenged the dual color printer and our Rhino skills. We created pulsating lights that were run by Arduino boards. On Thursdays, we would teleconference for an hour with our WXML math group counterparts, to shed light on the mathematical nature of sandpile models (chip-firing games). This resulted in series of new textured forms designed by Timea, both cups and larger vessels, with a dense yet delicate, almost bead-like design that shows the equilibrium state of each matrix. Surprisingly, each matrix size (think rows and columns!) produces a slightly different pattern of distribution in this final state of stability, yet there are some matrices that never stabilize. We don’t yet know why. In November, we opened our doors for our Fall Open House, which was not only well-attended but also offered networking opportunities among diverse communities of clay, glass, engineering, IxD/UxD, and Women in 3D Printing, which Slip Rabbit is proud to be a member of. Timea visited Material Matters at ECUAD for a day of tech exchange and we were happy to welcome UCSB art historian and craft history expert Jenni Sorkin for a studio visit and discussion about digital ceramics. Jenni’s visit (and UW lecture) inspired Timea’s new interactive project: be-HELD, in which participants are asked to “dance with the machine” while it prints a particular shape that could not otherwise be made by and on the printer. This interaction was a highly popular party trick at our open house. We love doing it too when we have a chance, because it demonstrates how much the human is initiating and authoring the process. We could always rely on our communication intern, Nick Wong, to document studio life and keep our Instagram page fresh. Below are a few images from these exciting past months. “The impending Holiday Season gives me an opportunity to reflect on our first year and a half as a non-profit studio with education and research mission in the area of digitally aided ceramics. I am deeply grateful for the the wonderful people, exciting projects and tantalizing possibilities I personally had the chance to encounter through Slip Rabbit, especially for our amazingly talented student interns who have many times provided the kindling for the fleeting sparks of wild ideas. This year, as I prepare the holiday meals, I am thinking of each and every one of you with whom I have had the good fortune to share tea, snacks and good conversations during those long workdays in the studio and who now are out in the world, continuing to push all of us toward a more equitable and humanistic future that considers both hand and technology, tradition and innovation. 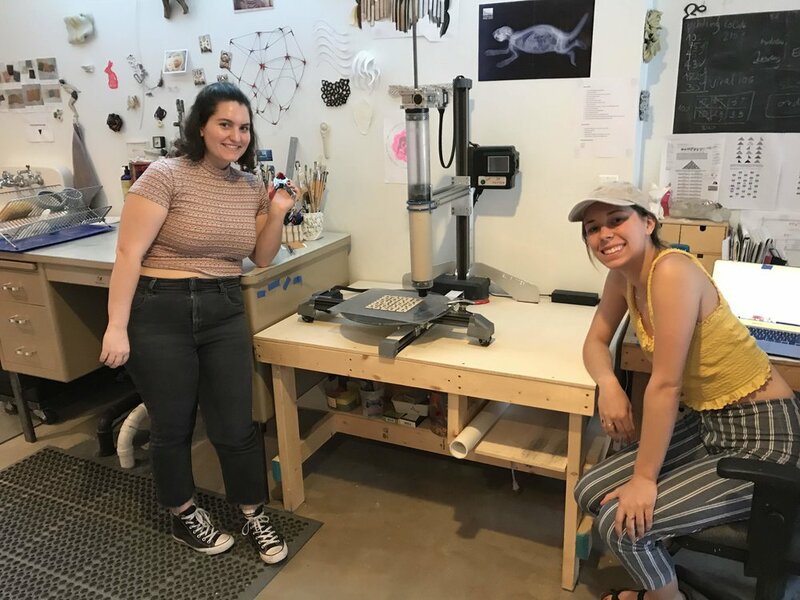 At Slip Rabbit, a lot of things have to come together for our ceramic pieces to be created—from 3D printers to math equations to files of code—but, perhaps the most important element of all was the creativity and hard work of our numerous interns. Over the next few posts, we want to showcase some of these interns—past and present—and give our audience the chance to learn more about their talents, aspirations and experiences. 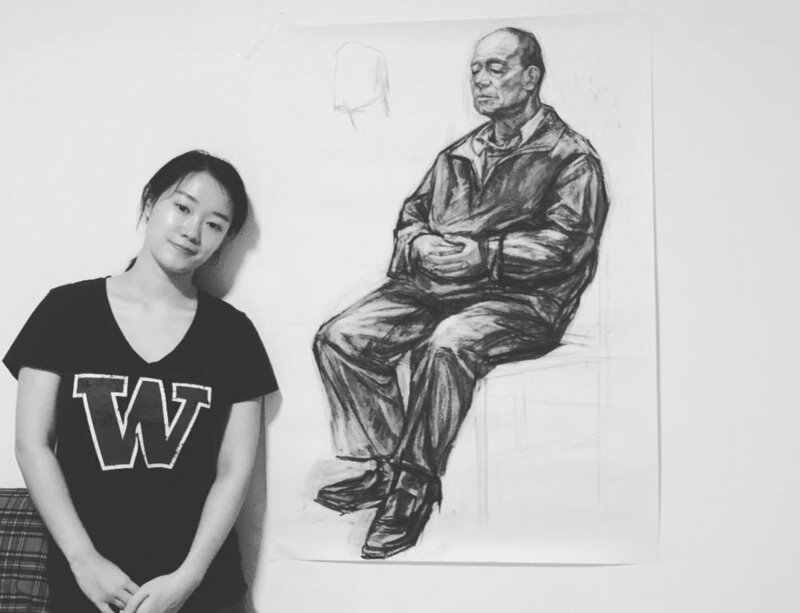 Huiqing Wang is also a recent graduate from the University of Washington, where she studied Interdisciplinary Art. Also, like Annabelle, she spent two quarters at Slip Rabbit, where she furthered developed her skills with clay. Huiqing has long been a devoted artist in ceramics, specializing in creating figurative sculptures that are capable of conveying so much within simplicity. What is an example of something you’re passionate about? I am passionate about making figurative sculptures with ceramics. The particular contact between my body with such material is actually the content of a certain work. What I am creating is also what I was and I am going to be. What ceramics intrigues me about is that sculpture that after firing out of kiln become to be the individual that on longer controlled by me or others, instead, it exists in the nature on its own. How do you find inspiration when you need to be creative? I am convinced that the best inspiration comes from the things that beyond expectation. When I urge to be creative, I will break through my routines and try something that fresh, challengeable or even “dangerous”. And I like to find inspiration from my previous experience, artworks, diaries and etc. I also have a notebook for writing down my improvisational ideas and sketch for later reviewing. What made you want to intern at Slip Rabbit? There was still a lot of things I want to learn from Timea after I graduated from UW. Also, I needed a place to take more practices in ceramics, sculpture and interdisciplinary art, such as the digital printing that combining my major with technology. At that time when I was leaving university, I noticed that I must try unknown things, open my mind and find my focus in artistic creation. What is something that you learned during your time at Slip Rabbit? We would work continuously until my last bus arrived in the evening. I understood that we never lack of ideas, but time and consistence to realize them. Art requires both sensibility and rationality, extreme caution and entertainment. What was the favorite or most memorable thing you worked on at Slip Rabbit? Here come a lot of lovely memories in my mind, and hardly saying which one is the most favorite. Specifically, there was always radio music accompanying us while we were working, delicious and delicate Hungarian snacks made by Timea, drinks with “homemade” cups, and the vigilant sniff from her kitten upstairs, and the smell of lavender. Are there any other creative ventures you have done since? I went back to China and interned in a Bronze Foundry for six months this year. My initial intention was to connect with my country but it turned out that I was alone in this way since all my peers who have studied art abroad did not choose to come back to China. Although it was not a great place for creating art, especially when people around me were not supportive or receptive, I learned to strengthen my willpower through protecting my principles from being assimilated. I am working on application for graduate school in China currently. I see my action as a creative venture, because the whole process of preparation for it is extremely examination-oriented and I possibly will get stuck in this mire. I want to experience the contradiction and struggles that millions of Chinese students are experiencing, but with a certain autonomy. Are there any creative ventures that you want to explore in the future? I want to bike to Tibet after surviving this year. Even after a brief interview, it’s clear that Huiqing Wang is someone who exudes passion and creativity, something that is so rewardingly evident in her creations. Her hard work, curious mind, generosity and tenacity make her one of Slip Rabbit’s most memorable interns. Annabelle Wu is a recent graduate from the University of Washington’s Industrial Design Program, who interned with us during the fall and winter of last year. 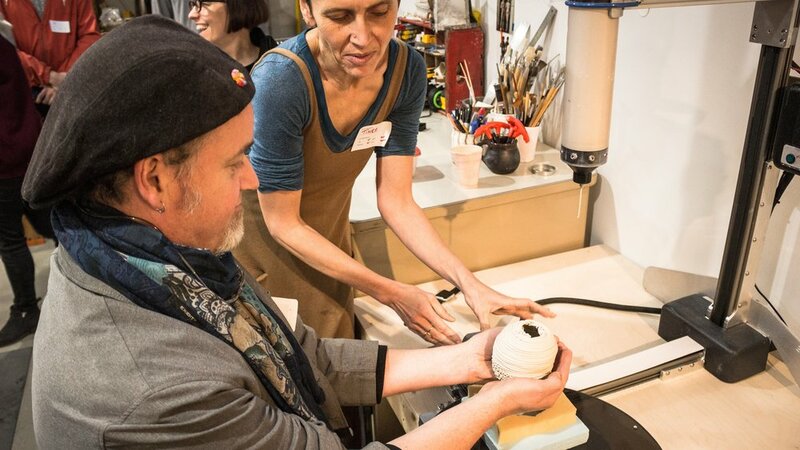 Annabelle got her first introduction to the art of ceramics when she became a top-five finalist for the Rometti Award in 2016 and earned a chance to work alongside the Ceramiche Rometti Studio to develop a limited-edition ceramic piece for their line. At Slip Rabbit, she was able to expand her creative range by working with porcelain. Since I was young, I have always enjoyed singing! It has been a creative outlet for as long as I can remember. If I'm stuck in a creative rut, I usually step back from whatever I'm working on and try to go outside. Nature is always a nice breather when I've been looking at a computer screen all day. Either that, or I find an activity that will challenge me to do something new. Recently, I have taken to bouldering on the off chance that I have free time. The year prior to interning at Slip Rabbit, I had the opportunity to compete in an ID ceramic competition in Italy. I had worked intensely under the guidance of the Ceramiche Rometti Studio that introduced me to a world of ceramics I was previously unaware of. When I saw the opportunity to explore porcelain as a material, I knew I wanted to intern at Slip Rabbit and experiment as much as possible. Always be ready to improvise! Porcelain is a living material and will always find a way to deviate from your original intended design. Its organic characteristics have taught me to adapt quickly and appreciate vividly. 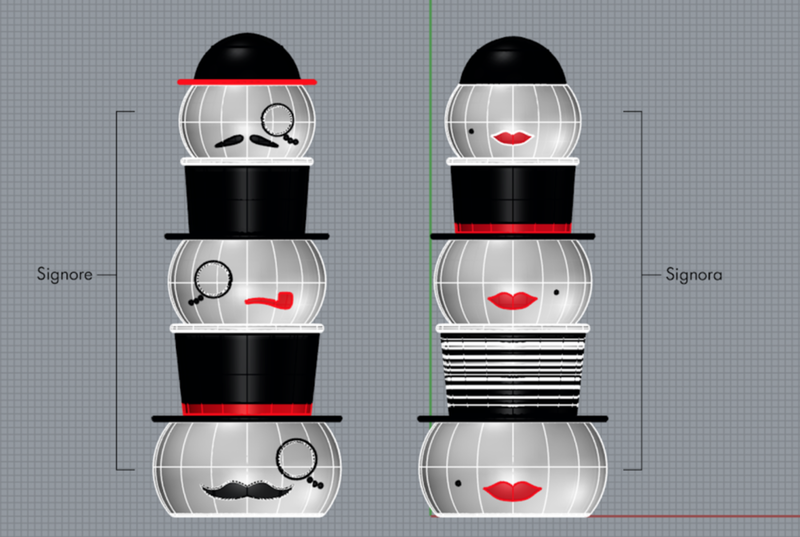 Professor Timea and I worked on a set of designs we liked to call the Loops. The 3D models created would have unsupported loop structures circling a vessel in various formats which, when printed, would slump due to having no supports and drape the vessel in a natural falling type of textured pattern. These were quite interesting to watch when printing. I haven't had the opportunity to continue working with porcelain, but I do draw and paint from time to time! When I have a bout of inspiration, I will 3D model mini projects that I would find interesting to pursue. If I work up the courage, I think glass blowing would be an incredible learning experience. I find the entire process of creating a glass piece so mesmerizing to watch. It's fascinating how a blob of molten glass can quickly transform to a beautiful form when handled correctly. To call her well-rounded would be putting it lightly. An individual who obviously has no shortage of creative outlets to channel her talents and ideas into, Annabelle Wu is definitely one of the brightest minds to have ever interned for Slip Rabbit. If you want to learn more about Annabelle and her work, visit her website. Our annual Slip Rabbit Holiday Sale has handmade 3D printed porcelain pieces for every table, every taste and every budget. at Slip Rabbit Studio, North Seattle (please email through our CONTACT page for address and directions). …and dozens of other great conversation pieces!!! Each design is unique, hand-painted and glazed, microwave and dishwasher safe. Sales help to support the our most important mission: Promoting access and artistic development in the area of digitally aided ceramics. We are excited to share the news that Timea was selected as the 2018 winner of the prestigious Neddy Award in Open Media. The Neddy is awarded since 1996 by the Cornish College of the Arts and the Behnke Foundation in memory of Robert E. (Ned) Behnke (1948­–1989). The 2018 awardee in painting is Lakshmi Muirhead. Congratulations to both winners and to all the finalists! The work of all the finalists will be on view during an exhibition at the Cornish Playhouse Gallery from Nov. 14 to Dec. 16. Our annual Slip Rabbit fall Open House is coming up on Saturday, November 10th from 3-5pm! Just like previous Open Houses, it’s your chance to learn more about our studio and the ceramic 3D printing process. Come for a studio tour, see printing presentations and technical demos, have your printing questions answered, and grab a beverage. You can also grab a cup to take home from our cup sale. If you are interested in attending, please contact us for studio address and directions at either our email at sliprabbit@gmail.com or our Instagram @sliprabbitstudio. We hope to see you here on the 10th! Temps are dropping, rain is back in Seattle. Our maple trees have started to turn. On most days, we have to lower and close the enormous studio door that connects us with the neighborhood, as preserve heat inside. Fall is here. This autumn we are experimenting with slightly more limited studio hours but will also be opening up for visits by various industry groups and organizations. We are already planning the Fall Open House, which is a good opportunity to see the latest projects and get a little technical introduction to 3D printing with clay. Timea is on a #3DTalk panel "Challenges of Developing Hardware: From prototyping to production line” during Seattle Startup Week. Her event is on Thursday, October 11th at 7pm at Thinkspace Seattle (1700 Westlake Ave N Suite 200, Seattle, WA 98109). Starting this fall, we are proud to be part of Women in 3D printing. We are welcoming 3 new interns to the studio: Kayla Lee (informatics), Erica Lee (industrial design), who will be working with Timea on all kinds of studio research and Nicolas Wong, who will be developing and implementing a communication plan for us. We are lucky to have Eli Kahn’s design skills contributing on our upcoming book project. Finally, one of the greatest joys of the studio life is building on the exciting long-term collaborations that we have established in the past. Prof. Sara Billey and Timea are going to be working on Abelian Sandpile models with math research help by a terrific WXML team: Connor Ahlbach, Catherine Babecki, and James Pedersen. See an interesting article by Scientific American on Sandpile Model of the Mind. 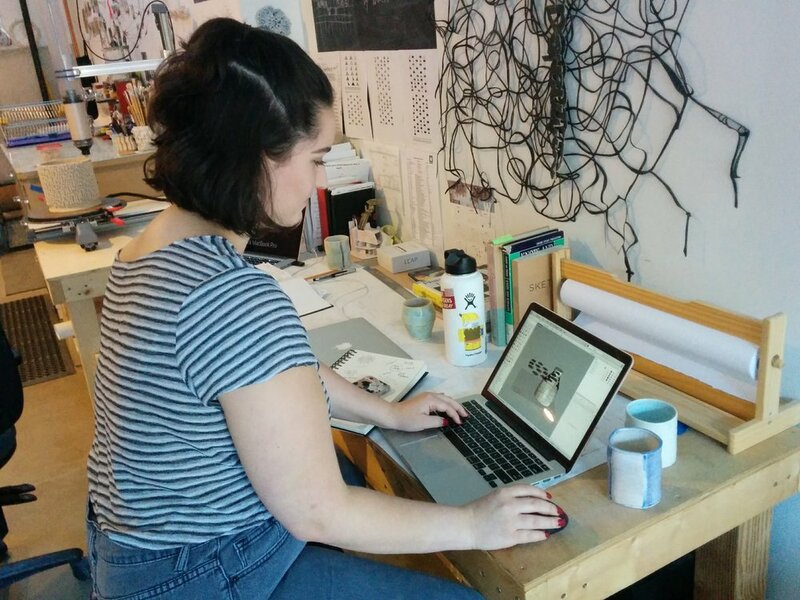 We welcomed our first artist/designer in residence, Audrey Desjardins in September. Preliminary discussions between Timea and Audrey about possible project ideas quickly had developed in a direction that combined both Audrey’s interest in data captured by smart home technologies and Timea’s interest in translating the lived experience (for example, body motion in space or memories of home) into objects with texture and pattern. The dynamics of our conversations was inspiring to both of us and thus we decided to collaborate. The week in the studio was intense and extremely focused and it went by quickly. Early on, we decided to limit our prototype project for environmental sounds, which were captured, logged and parsed according to the relationship between human speech hearing and sound volume. We had lots of options for making this data information manifest on the form but decided to focus on writing the gcode directly. After many iterations, coding and printing tests and refinements, we managed to develop a successful workflow and had a vocabulary of textures at our disposal by the end of the week. On Audrey’s final day in the studio we were printing a family of cups, which serve as research prototypes. The project, of course does not stop here. There were additional ideas coming out of nearly every step of the way and we tried multiple ways of recording the process as well. The project also gave us an opportunity to seriously investigate the nature of user data captured in our daily lives and the way object, context and narrative shapes the interpretation of this data. We are turning our Instagram and this blog post over to Audrey this week. Smart thermostats. Home assistants. Smart locks. Connected security cameras. Smart fridges. Programmable lights. As home dwellers, we are promised everyday seamlessness, increased security, efficient energy usage, and entertainment. In exchange, homes become new sites of data production, collection, and analysis. In this project, I am interested in investigating the historical logs of data captured by these connected devices in the home (also understood as Internet of Things (IoT) devices). While much focus in interaction design today is on the real-time use of data to respond to home dwellers’ needs, I am concerned with the longer traces that are left by these devices and services. During my artist residency at Slip Rabbit Studio, I am investigating ways to materialize this long-term data into everyday ceramicware objects. 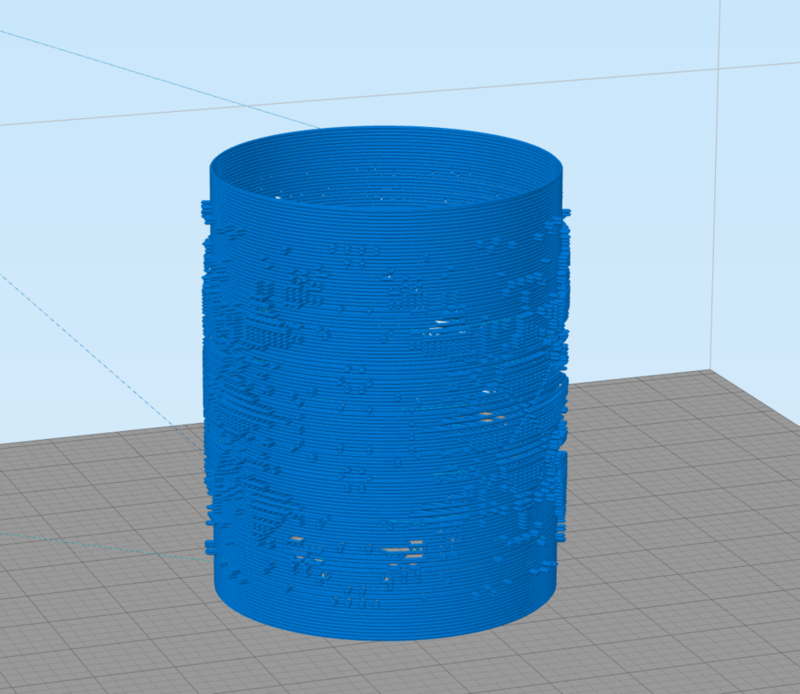 Together with Timea Tihanyi, we are working on a workflow that translates data points into new textures on porcelain cups that are 3D printed at Slip Rabbit studio. This data, based on current IoT products, can be the number of times a door was open, the constant noise level in the home, or trends in temperature in the home. Because the data is used ‘in the moment’, it often doesn’t leave a trace. Home dwellers are left with no other choice but to trust the data that led to changes in their home. This opens questions around the validity of the data, the sensibility of sensors, and the real effects of data collected. As a result, I wonder if IoT data could also be imaginary. Could we think about capturing data such as how many times racoons pass by, the intensity of the television glow, or the number of termites inside the home’s timber. IoT data is often invisible and untraceable: provoking our imaginations to run wild, dreaming of what data is considered, and what data remains uncaptured. By creating a closer relationship to data in the home this project aims at examining home data capture and production through data physicalization. By blurring the line between real data, and potential and imaginary data, we will investigate the complex ways in which we encounter with connected objects in the home. This project is a conceptual probe about the future of domestic technologies. 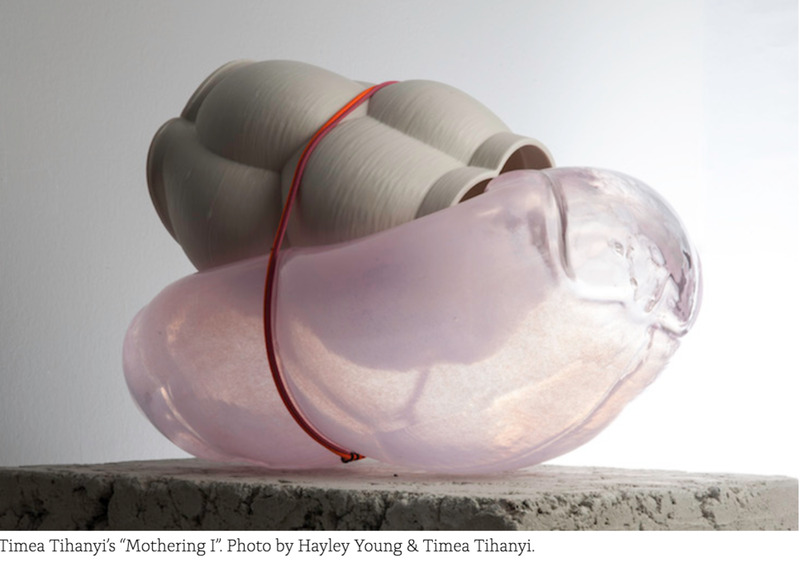 It is as much a deep dive into the material world of 3D printing and ceramic as it is an exploration of forms of data collection and accumulation in the home. This week, we are excited to kick off our Slip Rabbit Artist Residency Program! 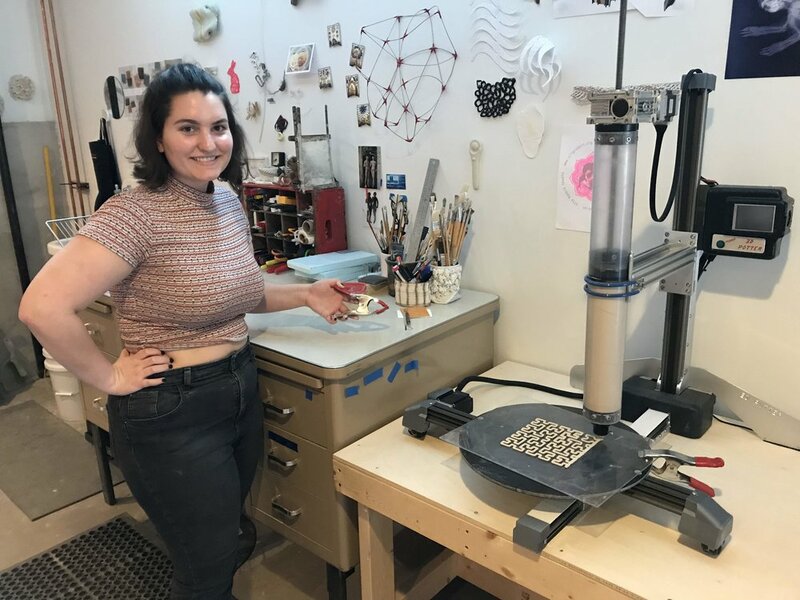 A fantastic interaction designer, Audrey Desjardins, is joining Timea in the studio to investigate together some data-capturing and data-tactility applications with the help of ceramic 3D printing. There. You’ve heard it here first. DATA-TACTILITY is the word we have invented for giving tactile form to data. This term focuses on the maker’s and the user’s experience of touch with regard to data information that is contained within the object. Tactilization is a noun. Tactilizing (data) is a verb. The incredible Pat Pauley of ARTbeat Northwest did an in-depth live interview with Timea on August 28th on KKNW. 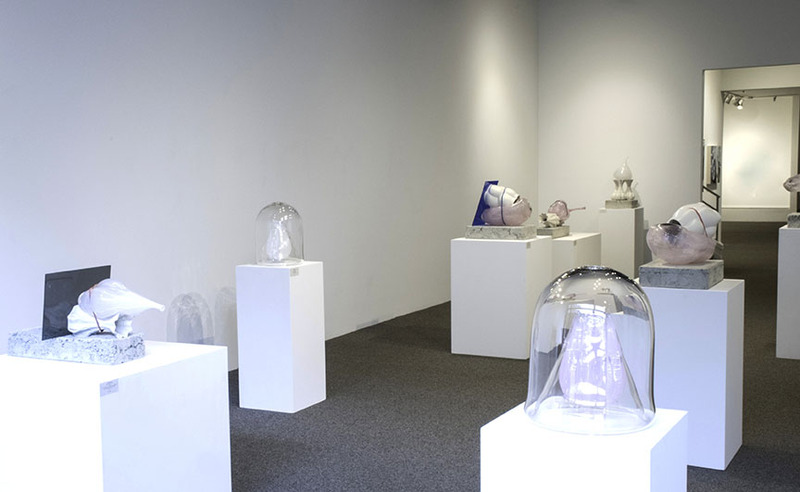 In this 27minute conversation, Timea discusses ceramic 3D printing, her current research interests and collaborations, and her 3D printed porcelain and glass sculpture exhibition Control and Release at the Linda Hodges Gallery. 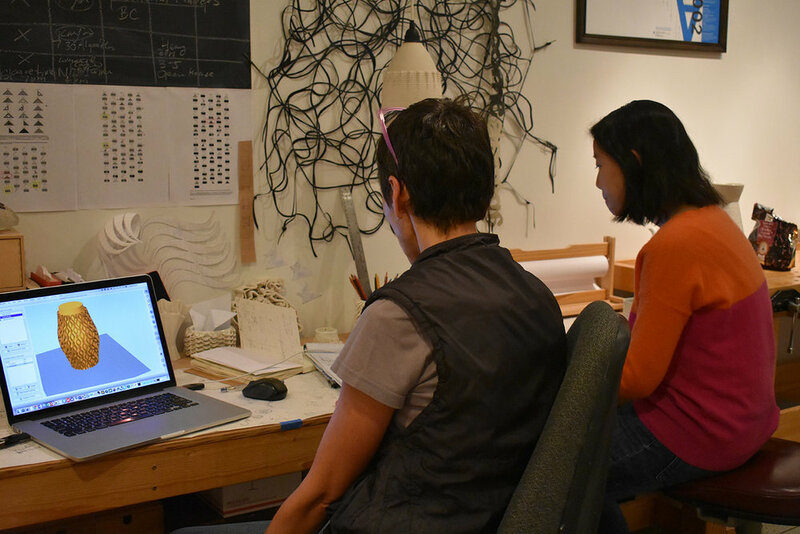 She also talks about how Slip Rabbit became a leading digital ceramics research studio in the Pacific Northwest and how the studio reaches across disciplines in order to push digital ceramics to new areas of exploration. Note: the show begins with a few minutes of listing of current events and sponsors' adds. Forward to 3'25"
We are on summer interim for these final few weeks of late August and early September, doing small remodels in the studio and gearing up for another exciting year. After the Seattle Magazine feature, Timea's work with Slip Rabbit and her current exhibition at the Linda Hodges Gallery have also received a shot-out from Evening Magazine on KING5. The TV crew paid us a visit and gathered lots of footage of the digital ceramics process, as well as an interview with Timea, which made it into broadcast on Wednesday, August 22nd in a mini spotlight feature. Timea's exhibition, entitled Control and Release, has opened during Seattle Art Fair on August 2nd at the Linda Hodges Gallery. This exhibition presents two bodies of work, Burst and Follow (algorithmically designed cellular automata 3D printed porcelain) series and blown glass and 3D printed porcelain sculptures made during her recent artist residency at the Museum of Glass, Tacoma. The exhibition, which received a shout out from The Stranger and Seattle Magazine, presents a dialog between body and mind, errors and code, the physical and the technological world. Show is open during regular gallery hours, Tue-Sat 10:30am-5pm, until September 1st. True to Seattle tradition, pre-4th of July weather has been overcast and cool. Regardless, we keep the studio door rolled up all day long and bees are already busying themselves on the lavender field right outside of the door. As Independence Day passes, four new Slip Rabbit interns have all but settled into the flow of the studio. Zeray Admasu is a fresh graduate of UW Mechanical Engineering, he will be working with the studio on learning more about gcode and writing gcode for form and pattern development. Alison Gray, a junior in Human Centered Design & Engineering, will also be supporting this research direction and helping Timea to connect mathematical ideas with coding. We are returning attention to space filling curves, which we started exploring in the spring, and exploring various classical computing transcription methods. An example of these, the Hilbert curve, is shown below. Caroline Slick and Eli Kahn came to Slip Rabbit from the UW design program. They will be honing their skills in form design using Rhino. Our thought is to develop similar patterns by using both geometric (Rhino) and algorithmic (coding) construction. Moving back and forth between the computer, our brainstorming blackboard and the ceramics workspace, gives studio-life a nice rhythm. Getting the clay ready, wedging, cutting, joining, handbuilding, firing, color techniques... Lots to do! Everyone is super excited about learning the language of clay as we experiment with various techniques and processes on the printed porcelain objects. We'd been looking forward to the studio visit by ASKXXI (Arts + Science Knowledge Building and Sharing in the XXI Century), a group of Chilean researchers, artists, designers, and educators. Their visit is part of Slip Rabbit's outreach efforts to establish creative and thoughtful local and global channels of knowledge sharing, science visualization and engagement with various practicioners and audiences. 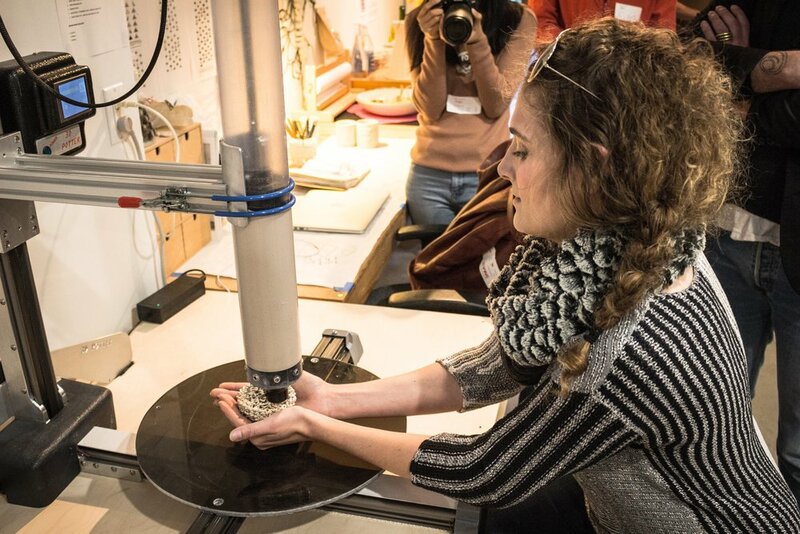 During their residency in Seattle, the 2018-19 ASKXXI cohort has been exploring various lab and field work in marine and land ecology and has taken workshops focusing on state of the art digital technologies, including, VR/AR, digital illustration and, now, ceramic 3D printing. It was a packed morning here at Slip Rabbit. The group filled our studio (standing room only!) with laughter and their energy was contagious. After the introductions, we set up a file of the diatom model made in Cinema4D by ASKXXI faculty and Cornish Design professor, Jeff Brice. Printing it gave Timea a chance to demonstrate challenges and benefits arising from the much larger scale and from the peculiarities of the ceramic material. 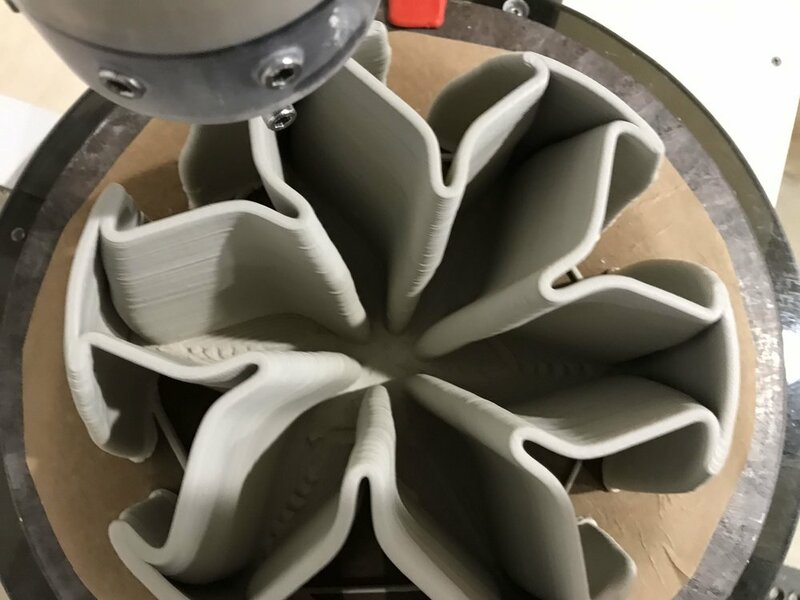 Compared to traditional FDM (fused deposition modeling aka extrusion) printing, clay printing has to contend with more variables, giving rise to its artistic potential. Clay, when used wisely, is one of the the most sustainable and environmentally considerate materials. The printing process creates excellent conditions for 0 (zero!) waste use and there are many research examples of experiments with 3D printed ceramic in the restoration of coral reefs and as climate-friendly low-cost, locally-sourced building materials. Timea also demonstrated the potential of traditional ceramic techniques, handbuilding and slipcasting, in combination with printing and discussed her current math-art research in self-generating complex systems that are based on simple rules. A number of wonderful ideas for the continuation of both our research and research paths taken by ASKXXI members arose from the visit. We are looking forward to witnessing the development of these and the positive impact on the critical environmental challenges that they may help to promote along the way. As described in earlier posts, spring brought several new and exciting research topics expanding our use of the ceramic 3D printer into novel areas of movement- and motion-capture. We have been testing several different types of equipment from HTC VIVE to Sense/Stage and Leap Motion and made good progress in capturing movement data and developing a work flow for using this data for object making. We greatly appreciated the suggestions of UW DXARTS professor, Afroditi Psarra, who came to visit the studio just at the right time and helped us to rethink the tools and means of data gathering. It’s been wonderful to have a team of interns so ready for play and fun! Afternoon studio hours flew by with each of us taking turns donning the VIVE headset and hand trackers and drawing in space while the rest of the team was working the computers, logging data, watching out for the tester’s physical safety and, sometimes, egging her on with a giggle. Working with VR was not only immersive but also a very inspirational experience. We have envisioned many art applications that connect the body, real space and virtual space in vital and innovative ways, as well as create objects the traverse from one to the other kind of spatial experience. With the beginning of the summer, we are embarking on a long-term research in this direction. We need new equipment, a PC for running many of our Windows based software, and, over time, we are looking to add a second printer. A little over one year ago, we started very small with modest ambitions. For any creative activity though, especially for those processes that involve technology and making of things, proper funding is critical. Our ability to push forward with this project has been given support from a 2018 4Culture Artist grant that Timea was honored to receive. In addition to this grant, we continue to be looking for and always welcome new collaborators and auxiliary funding sources. If you’d like to contribute, please send us a message through our CONTACT page. Slip Rabbit is receiving a number of inquiries in these past months. We've been hearing from many of you in tech, math, research, education, and maker communities near and far. We are honored to be asked, deeply enjoying the dialogue, and very excited about all these newly forming partnerships. Please keep them coming! The last look at our studio blackboard (the ever-changing platform of our research notes and an ephemeral sort-of-archive of all our brainstorming sessions) noted no less than SIX project directions, many of them will probably last us for years. This month, we are welcoming Matt Conroy of UW Math, who has done animation work with cellular automata (CA) and Seth Friedman, who is a physicists and an expert on various 3D scanning and manufacturing methods for medical practice. Both Matt and Seth also have an active art practice. Interestingly, many new techniques in medical practice are quite similar to those used in our studio. To demonstrate, we printed a scan of a set of teeth generously shared by Dr. Lemke of our neighborhood Dental Clinic. Our most recent connection is with ASKXXI: Arts + Science Knowledge Building and Sharing in the XXI Century, a pioneering exchange program fostering US-Chile cooperation and collaboration in the arts, emerging technologies and the ecological sciences. A group of students and scientists from Chile will visit us in June to learn about printing with clay. Slip Rabbit is currently seeking grant support and sponsorship that will allow us to expand into working with megatronics and other sensor based software systems. Timea took a Sense/Stage workshop with Jonathan Reus. This week, we visited the offices of Motion Workshop and got a great demo of the Shadow MoCap system from Luke and Eric.